I’m going to be honest, these whoopie pies started out as Root Beer Float Whoopie Pies. HOWEVER, I was not a fan of the root beer filling….at all. 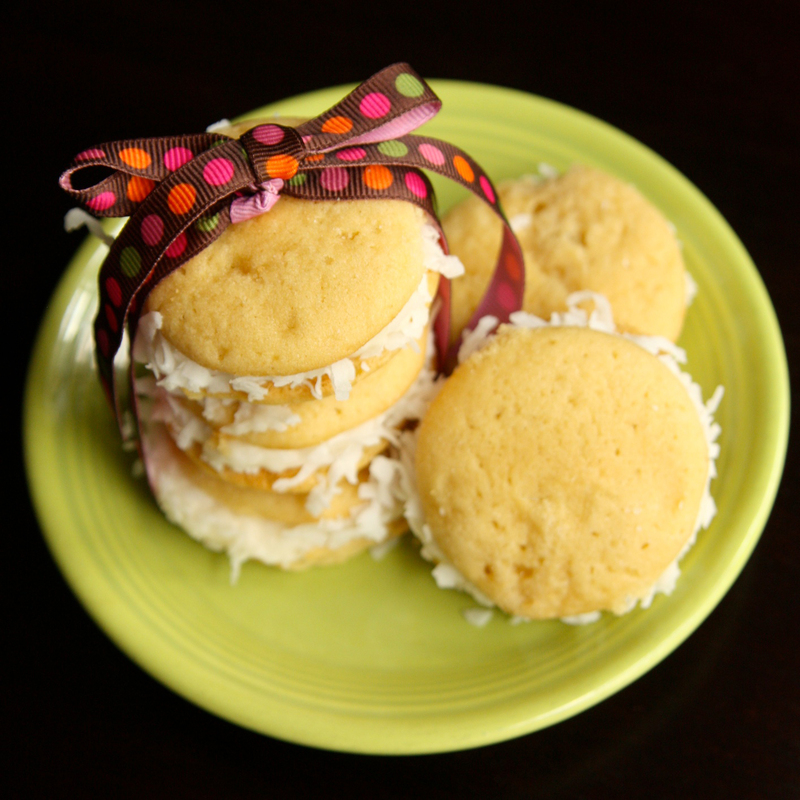 So these became Vanilla Coconut Whoopie Pies. Two flavors that I am very fond of. I had coconut out for the Samoa Cupcakes I was working on and thought to myself the vanilla coconut combo would be sweet and summery. Position a rack in the center of the oven and preheat to 375 F. Line two baking sheets with parchment paper. In the work bowl of a stand mixer fitted with the paddle attachment, beat together the butter, shortening and both sugars until light and creamy, about 3 minutes. Add the eggs and the buttermilk and beat until combined. In the measuring cup, combine the milk, baking soda and vinegar. Add milk mixture to the batter along with the flour mixture on medium for about 2 minutes until completely combined. Using a spoon, drop about 1 tablespoon of batter onto prepared baking sheets and repeat, spacing them at least 2 inches apart. Bake one sheet at a time for about 10 minutes each, or until the cakes begin to brown. Remove from the oven and let the cakes cool on the sheet for at least 5 minutes before transferring them to a rack to cool completely. Cream butter in using an electric mixer. Beat in coconut extract and vanilla. Slowly beat in confectioners sugar a little at a time until well blended. Add milk until frosting reaches desired consistency. Spoon the coconut buttercream into a decorators bag. Pipe coconut buttercream out onto whoopie and sandwich between two pies. Roll sides in flaked coconut to garnish.